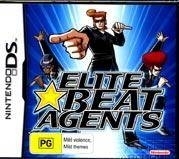 Elite Beat Agents: For When You Just Can't 'Heeeeeelp!' Yourself. Such was probably the conversation that went on between iNis and Nintendo when deciding how to make their popular Japanese ‘Osu! Tatake! Ouendan!’ series relevant in the US. 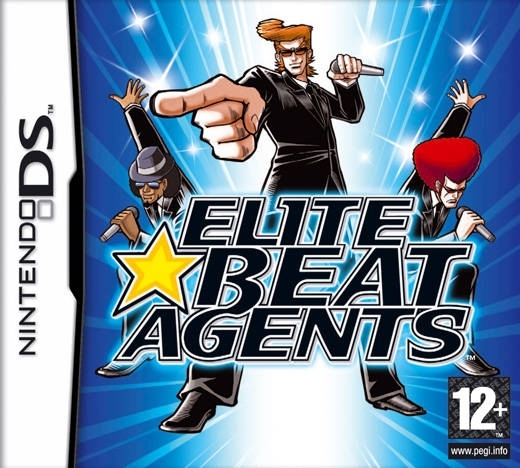 Elite Beat Agents revolves around a group of agents (who differ depending on the difficulty level) who make a living out of locating people in need and dancing their hearts out to classic pop songs, which magically helps them get through their situation. Throughout EBA, players will help a news reporter clear the cloudy skies so she can have a picnic with her son, assist a down-on-his-luck oil baron in striking it rich again, and make sure a speed-demon taxi driver gets a woman in labour to the hospital on time. 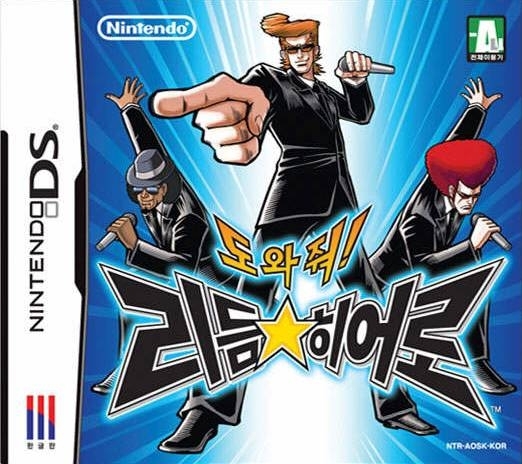 There’s not much in the way of a continuous plot, but the final two songs (the only two which fit together, and are the only ones whose plot directly involves the agents) bring almost every character in the game together for a fantastic climax. It’s a little cliché (you’ll be forgiven if you’re reminded of Pokemon: The First Movie), but the events really got me pumped to get back at the antagonists. 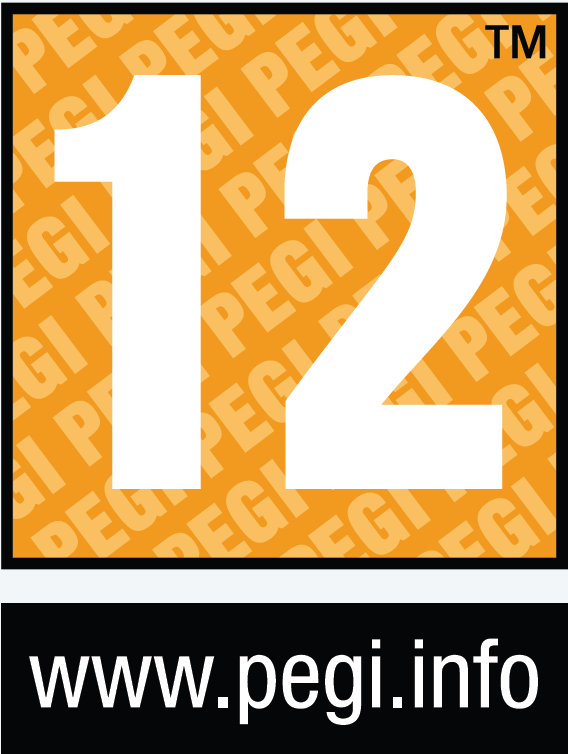 Gameplay in Elite Beat Agents is entirely stylus-based. Throughout every song, a ‘beat’ meter is constantly emptying. If it is allowed to empty completely, you fail the song. Numbered circles will constantly appear on the bottom screen (in time with the song’s beat), with larger circles growing smaller around them. The closer the outer circle is to the circumference of the inner circle when you tap it, the more points you earn, and the more of the beat meter you restore. The circles must be tapped in the order represented by the numbers. You’ll also have to contend with beat balls, which you must touch and then quickly drag across a specified line, and occasionally spinners, which must be spun a certain amount of times within a time limit and usually are found at the end of a song or at pivotal moments. In addition to showing you how close you are to failing the song, the beat meter’s length determines how well the particular story’s characters are doing in accomplishing their tasks. As you progress through the song, the top screen will show the characters working toward their goal (what they are doing changes throughout the song). Their success or failure depends on if the meter is in the yellow zone or the red zone, respectively. Every few stanzas, the beats will disappear, and a quick portion of the story will play out on the top screen. In one song, if you managed to keep the meter in the yellow, the baseball player you’re helping will ride a roller coaster up to the evil lava golem’s head and clonk him in the face with a bat. If you let it fall to the red, he’ll attempt to do this, and nearly get swallowed in the process. It’s still possible to pass the song even after failing all three sections as long as the meter doesn’t run out, but the characters are so vibrant and pure that you’ll really feel bad if you mess a section up, and if you’re like me you’ll immediately replay that song. Don’t worry, though—whether you pass or fail a song, the results are always either hilarious or emotional. One disappointing aspect of the game is the unexpected difficulty spikes at random songs throughout the game. To start off with, you’ve got the relatively easy “Walkie Talkie Man”, which has just the right level of challenge while still easing you into the game. Beating it unlocks a few more, with steadily increasing difficulty. However, in seemingly random places, the game will toss in an incredibly difficult song (I’m looking at you, “Canned Heat!”) that is disproportionately harder than what’s come before, and then settles back to a more reasonable challenge level in the next song. Most of the time, the lyrics of the songs associated with each story are relevant to what’s going on. Of particular note is Madonna’s “Material Girl”, which plays as you attempt to help two pampered movie stars survive on a deserted island, and “Makes No Difference”, where you help a Lucas-esque director make a blockbuster film to save his career. There are a couple of oddballs (how does “YMCA” relate in any way to helping a sea captain find underwater treasure?) but most of the time, you’ll be able to see the direct links between the song and the action, and this helps a lot to draw you in. 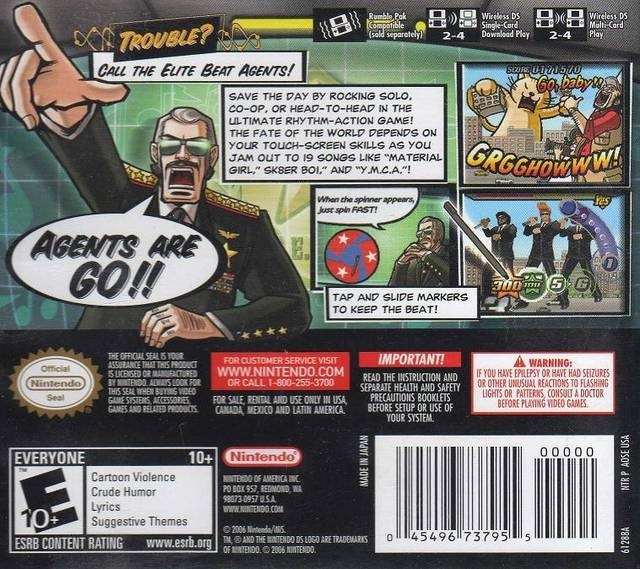 Graphically, Elite Beat Agents looks very attractive. The visual buzz words for this game are “bright” and “energetic”. Most of the game, including the characters and environments in the stories, as well as speech bubbles and beat circles, is represented by large, detailed 2D sprites. Characters’ emotions are suitably exaggerated, so you really empathize with them when they’re sad, overjoyed, or just plain angry. The agents themselves are rendered in full 3D glory on the bottom screen, doing all kinds of dance moves and falling over in extremely comedic fashion when you miss a beat marker. I do think that the DS could have handled giving them a few more polygons, what with them being the only 3D content in the game, and their textures are fairly low-resolution. However, it’s enough to get the point across, and they’re just as well-animated as the sprite-based characters. As far as sound goes, EBA is above average. The sound effects are well-done and over-the-top. The sound effects for hitting a beat marker differ depending on the song, but the various cymbal-clashes, bells, etc., all fit their accompanying songs well and are loud and crisp. Unfortunately, probably the biggest slag on the game is the sound quality of the songs themselves. 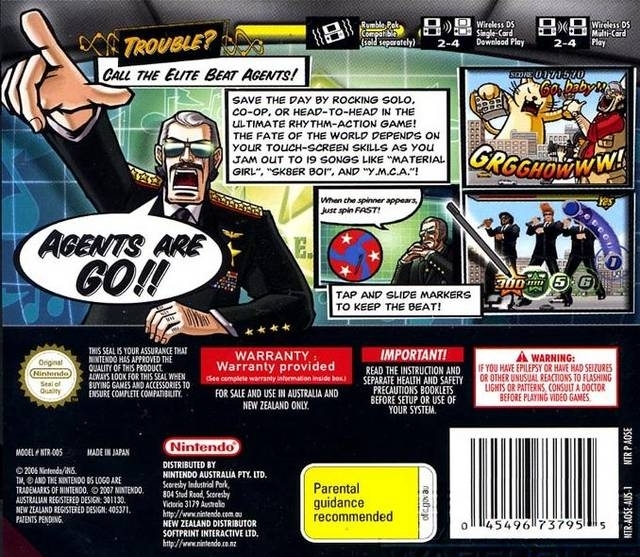 The game was made before the availability of higher-capacity DS cartridges, so a fair amount of compression was necessary to cram in all 19 songs. Don’t get me wrong—they sound fine and you won’t be too aware of the small lost details while you’re in the middle of an intense session. Just don’t go in expecting MP3-quality audio and you won’t be disappointed. With regard to value, EBA has a deceptive longevity. It only has 19 songs , rather low for a music game (three of which must be unlocked by getting a cumulative amount of points for all songs put together across all difficulties). However, the difficulty is always such that you’ll keep going back for another round, as it’s always clear that you can boost your high score if you ‘just do a liiiittle better on that one section’. It also helps that these are some of the most addictive songs you’ll ever come across. 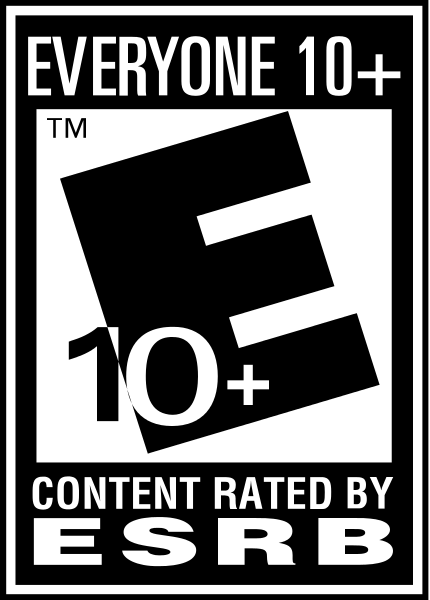 There are five difficulty levels, only two of which are unlocked at the beginning. The game's length varies considerably depending on how fast you can move your fingers--some will beat the default 2-star difficulty in four to five hours, while others may take twelve to fifteen. It’s worth going through the game as each agent, just to see their different funny poses (especially the Elite Beat Divas on the 4-star difficulty). The game has full multiplayer support for up to four players in each song, in either VS. or coop modes, and each song has a different story attached to it than in the single player (the VS mode stories tend to fittingly depict some type of competition, like a basketball game). You can also download your friends’ ghosts and compete against them at any time. Unfortunately, only four songs are available when playing with single-card play. Online play is sadly absent, however, and as the game has not exactly set the sales charts on fire, it’s unlikely that you’ll find someone to play the full complement of songs with. Finally, the game allows for one replay to be saved for each song. This can be helpful if you want to look at parts of a song you can improve on if you’re looking to beat your high score, or just to catch the nuances of the story on the top screen that you probably missed while you were hammering furiously away on the bottom. 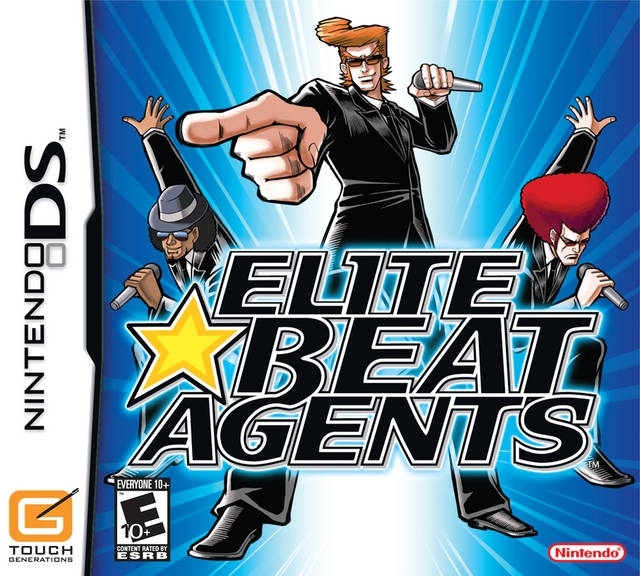 All in all, Elite Beat Agents is an excellent choice for a DS gamer looking for an alternative rhythm game to Guitar Hero or the recently-released Rhythm Heaven, and if you’re a fan of anime, all the better. It’s simple and addictive, with a lot of comedy and attitude, and a little emotion tossed in for good measure. It’ll keep you occupied for quite some time with the unlockable songs, multiplayer, and difficulty levels, as well as just the sheer fun factor. 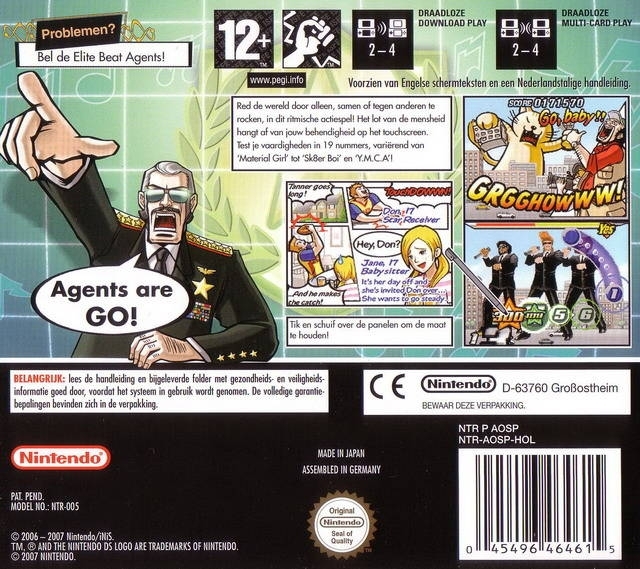 EBA is one of the best ‘hidden gems’ on the DS, and we should pray to the gods of iNistendo for a sequel.